Convincing people to download and begin regularly using an entirely new web browser is a pretty tall task for an online ad, which is why we’re always testing different approaches to see what works. 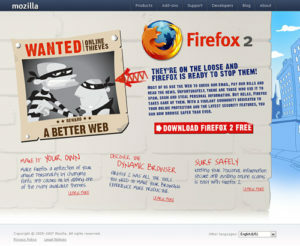 We recently asked Nobox to come up with concepts for two online ads around the themes of security and customization (key points of differentiation between Firefox and the competition). The ads started running a few days ago…my esteemed colleague David Rolnitzky has a detailed breakdown of the thought process behind them on his new blog, so definitely check that out. Our main request to Nobox for the security ad was that it be very benefits-focused…in other words, communicate how browser security (or the lack thereof) directly impacts the user, rather than just making a generic statement about what Firefox’s security features are. For the customization one, we asked them to explore some non-technical metaphors (besides the somewhat played-out one of souping up your vehicle) that would help explain what add-ons are and how they can help you. Nobox processed all that and came back with an interesting approach: cartoons. When they first proposed this I have to admit I was a little uncertain, but they quickly sold me with their specific concepts, which communicated our key points in a very fun and engaging way. I feel like it’s important to be serious about what we do, but also not to take ourselves too seriously, and to me these ads do a good job of doing that. Of course, online advertising provides very well-defined results so the users will have the final say! The landing page for the security ad is below. You can see the other landing page plus the ads themselves on David’s site.